sentenced to more than 12 months imprisonment without a fine option, but only after an appeal, and this disqualification ends five years after the sentence is completed. The Commission will consider and make a determination on all objections and notify the objectors and affected parties of their finding by 8 April 2019. Any party, candidate or objector aggrieved by the decision of the Commission then has until 11 April 2019 to appeal to the Electoral Court. 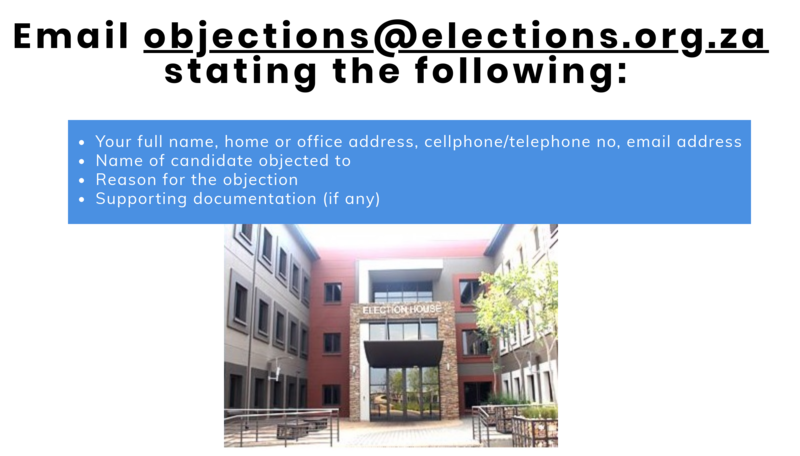 In 2014, there were 45 objections and one was upheld by the IEC. The candidate had been convicted of an offence and sentenced to more than 12 months in prison — and it had been less than five years since the candidate's release from prison.